The self-feathering feature of the luminosity masks makes them incredibly useful. It's like making the perfect selection each and every time with no effort at all. No zooming-in to make sure all the necessary pixels are included in the selection and no need to go back and touch up the edges of selections after the adjustment is made. The luminosity mask takes care of all that. In addition, the "Lights" mask is only the starting point for the different types of luminosity masks that can be created. The "Lights" mask is useful if you want to adjust the light areas of the image, but the shadows and mid-tones frequently need adjustment too. From the basic "Lights" luminosity mask, a large number of additional masks can be generated that target these other brightness levels in the image. I'll list them below and describe how they are made. Using this information you should be able to make a series of Photoshop actions to create the various masks. Information on how to obtain a set of actions for all the luminosity masks is available on the last page of the tutorial. With an action set, you simply need to run the action for a particular mask and it's ready to use. I've chosen a different image to illustrate the various luminosity masks, one that is less abstract and therefore easier to see the features in the masks. As you look at the various masks, you will always see a grayscale outline of the original image. Selections from these masks, as a result, will have the perfect tonal gradation so that adjustments made using the masks will blend in seamlessly. While the "Lights" mask would seem like a good one to use in adjusting the light areas of the image, "Light Lights" and "Bright Lights" often work better. There is a lot of gray in the dark values of the "Lights" mask, so adjustments through this mask significantly bleed into the image's dark values. The "Light Lights" and "Bright Lights" frequently do a better job of isolating the adjustment to just the light values since the dark values of the image are darker gray or even black in these masks. The "Basic Mid-tones" mask is one of my favorite luminosity masks. Depending on the image, the mask for it will appear nearly black or very dark. 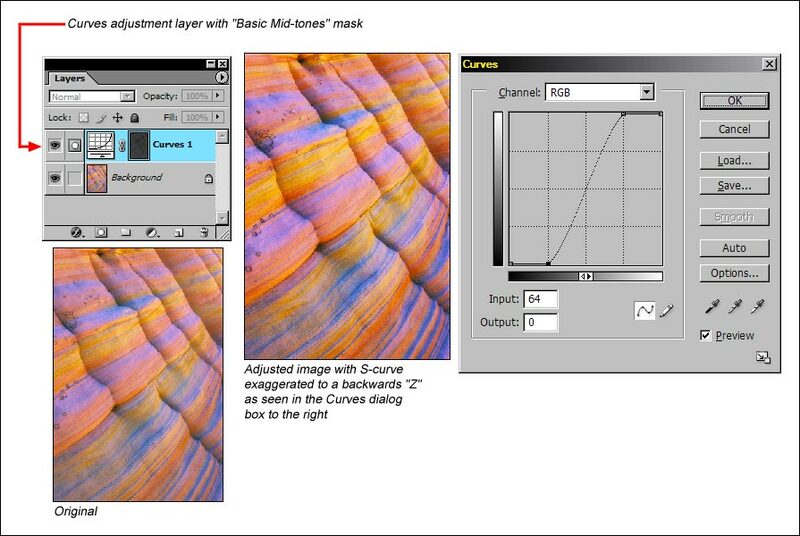 It takes an extremely steep S-curve in the Curves dialog box applied through this mask to create a noticeable change in the image. In fact, you can pull the quarter tone values to their respective bottom and top positions, essentially making the S-curve a backwards Z-curve, with only a small change to the image. But what a beautiful change it is! For the right image, this adjustment is similar to taking the picture with Velvia. It's often provides the perfect pop to contrast and saturation (Figure 14). As you create luminosity masks, the dialogue box in Figure 15 may pop up. This dialog box is saying that because less than 50% of any pixel's opacity is selected, the marching ants won't appear. It does not, however, mean that there is no selection. For some luminosity masks, having only 40% or even 20% of pixel opacity selected works just fine. When you add, subtract, and intersect luminosity masks, it's quite possible to create one where no pixels are more than 50% selected. Such a mask will appear very dark gray or even black. The "Basic Mid-tones" mask is a good example. Even though there are no marching ants when the mask is loaded as a selection, adjustments through the mask will still occur and be perfectly feathered. You may need to stretch, push, or pull adjustments to the extreme to see a noticeable difference in the image, but the luminosity mask will be doing its job of properly targeting the intended tonal values. So if the dialog box shows up, just click "OK" and continue.